You guys know I haven’t been reading a lot of contemporaries. I love them to pieces, I do, but recently I’ve been drawn to more paranormal/science fiction/steampunk adventures. Well, Meant to Be kind of restarted my whole love for contemporary. I read it months ago and I’m excited to finally share my thoughts with you! For Julia, this trip is perfection beyond perfection. She get’s to go to London and work on winning the heart of childhood crush Mark Bixford, her MTB. However, Julia’s whole trip is ruined when she’s partnered up with Jack. Jack makes her life miserable and this is no exception. She thinks this is the worst thing that ever happened to her, especially after he drags her to a party against the rules. The next day, she begins receiving romantic texts and so the adventure begins. Together Julia and Jack must break a few rules in order to find Julia’s secret admirer. Will she who for it or will she stick to her ever guarded rules? Julia is crazy character to love. She’s klutzy, back straight, follow all the rules kind of a girl. She can be quite annoying if I do say so myself. Here’s the funny part though, I loved her for it. She’s so real in all of her quirks I kind of wanted to hug her for it. Her MTB (meant to be) search is hilarious and something every girl can relate to. Now, there’s the other side of the story, Jack. He’s the class clown, let’s make Julia’s life miserable kind of a guy and super adorable while he’s at it. His personality was so much fun and games I loved when he showed up on the pages. Their relationship is fresh and exciting because it’s not all a bed of roses. Both are quite big on the thorns part, arguing more than talking. I want to hug both of them crazy kids. Seriously guys, I’m a huge fan of this book. Have you seen the cover? It’s amazing right? Well, the words inside, just as awesome. Lauren does a wonderful job writing a story that’s not only fun, but sweet and exciting, all wrapped into one perfect package. If I wasn’t laughing, I was rooting for Julia and Jack. If I wasn’t rooting, I was yelling at them to get their heads screwed on straight. Now that’s the kind of response that makes for a great book! 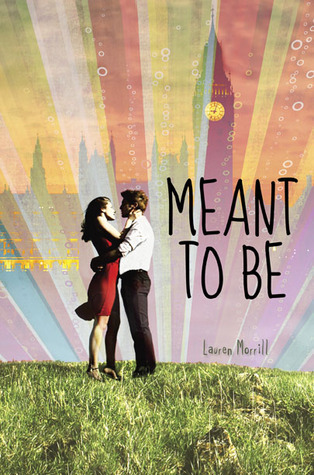 Meant to Be comes out November 13th, 2012! Get it, read it, love it! Let me know what you think!